Discover why our ghoulish Halloween puns inspire the fun elements of this holiday. With a skeleton crew, we looked at everything from bats to witches, ghosts to pumkins, and all the other things associated with this macabre holiday, to come up with these play on word possibilities. Was it a witch hunt? Well, yes, maybe it was. Will some of these selections drive you batty? Maybe. But, we hope you enjoy them all. 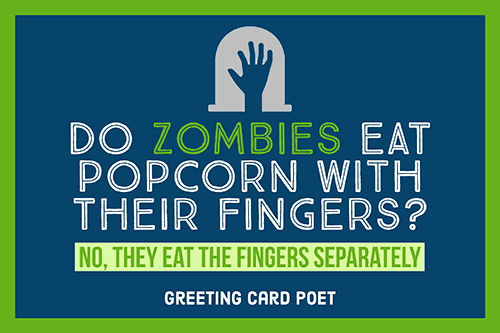 So, if you hear the sound of croaking and groans during the Halloween season, it could be the living dead…or it very much could be people reacting to these puns! You might as well call them the scream of the crop. What do you call someone who puts poison in a person’s corn flake cereal? Because everyone was a goblin! 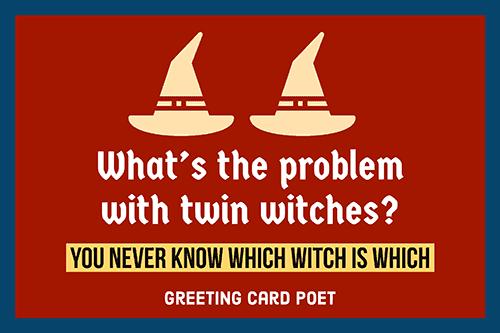 Check out our funny, Halloween Jokes. What was the witch’s favorite subject in school? What did the mummy say to the detective? Let’s wrap this case up. No one likes spoiled children, so be sure to close the container tightly. I seriously can not hold my liquor. I don’t need no body. What do you call a witch in the desert? 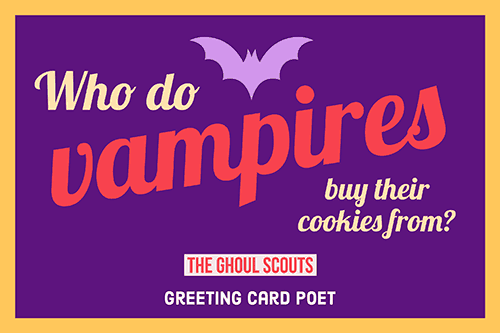 Who do vampires buy their cookies from? Where do fashionable ghosts shop for costumes? How do you dress as a tea cup for Halloween? Just dress in a cup with the letter T.
What do you get when you cross a person dressed as a silverware utensil in the middle of traffic? What is a magically delicious and nutritious? A person dressed as a fairy kale. How can you show you have great chemistry with your partner? By dressing as a pair of test tubes for Halloween. What do you call when you cross a seafood costume and a alcoholic beverage? 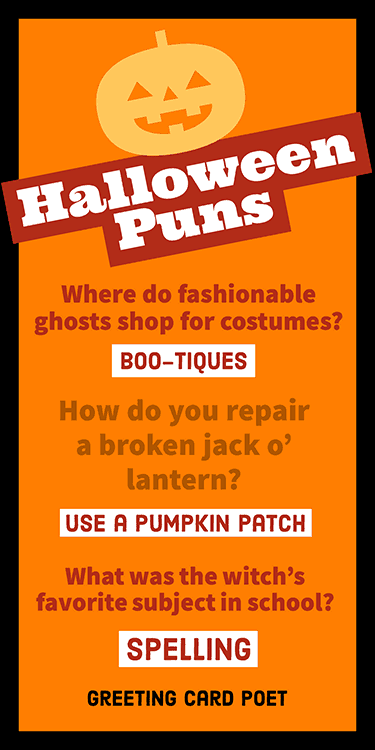 How do you repair a broken jack o’ lantern? Where do jack o’ lanterns live? In the seedy part of town. Who helps little pumpkins cross the road safely? 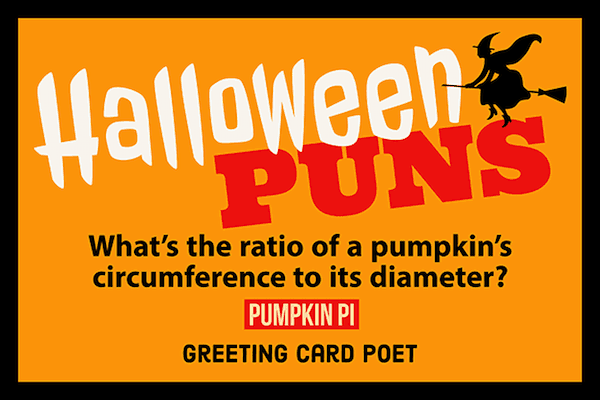 What do you call a little pumpkin who doesn’t listen to the crossing gourd? What do you call a chubby jack o’ lantern? What does a pirate jack o’ lantern wear? Why didn’t the jack o’ lantern cross the road? He didn’t have the guts to. You’re on our Halloween Puns page.